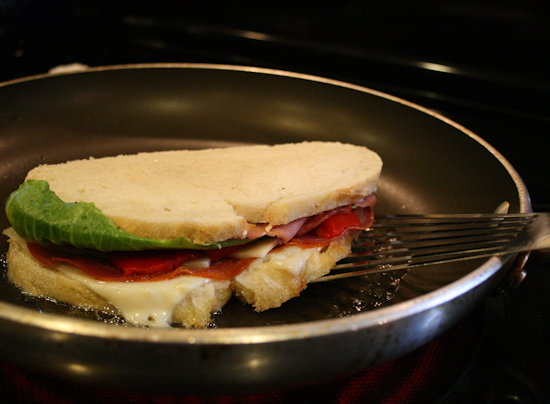 Paninis are cooked in specific grilling machines called either panini presses or simply panini machines. 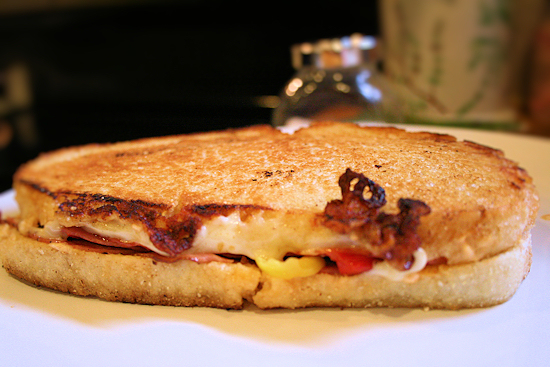 Domestic panini machines are usually made of teflon-coated metal or glass-ceramic, whereas professional units are made out of glass-ceramic or cast-iron. Well… I don’t have a panini machine, mister wikipedia! So, what now? I will tell you what now. We make our own machine. Well, sort of. 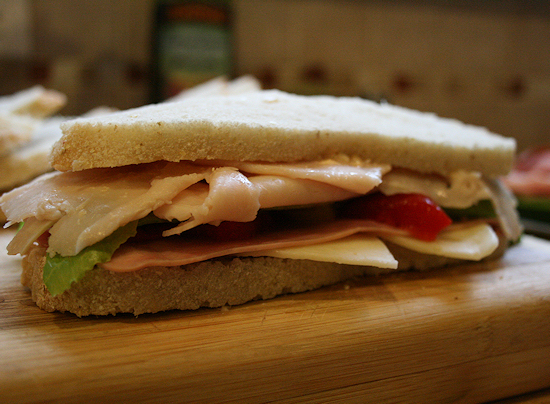 I don’t need a fancy machine to press a sandwich. 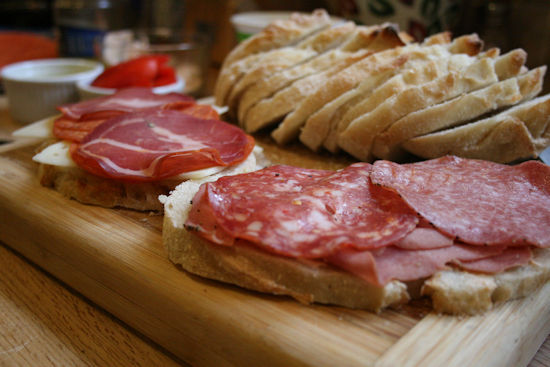 I just need some wonderful bread, nice cuts of meat, cheese, oh and something heavy. It just so happens that the other day, a woman from work came in and was selling her homemade white bread. How could I resist? I bought 2 loaves and the immediate idea that popped into my mind was “Paninins!”. 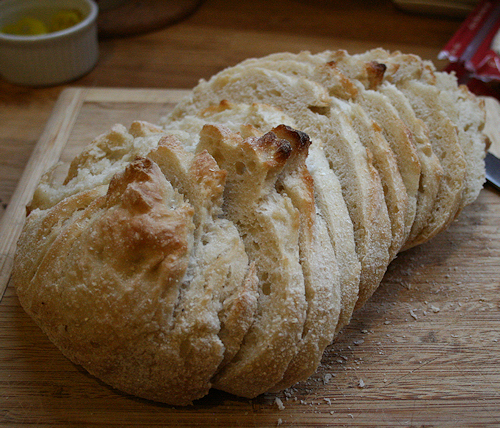 This bread tasted more like white Tuscan it was so soft inside but chewy on the outside. Yes, I tried it right there in my office. That is the bread we love. 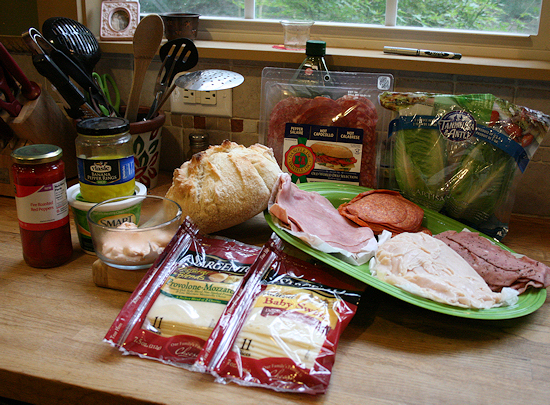 Mixed assortment of deli meats. As you can see, the first thing I did was to lay the meats and cheeses I was going to use out onto a tray, put the condiments in a bowl and tore my lettuce leaves. This just makes it all easier to put together. 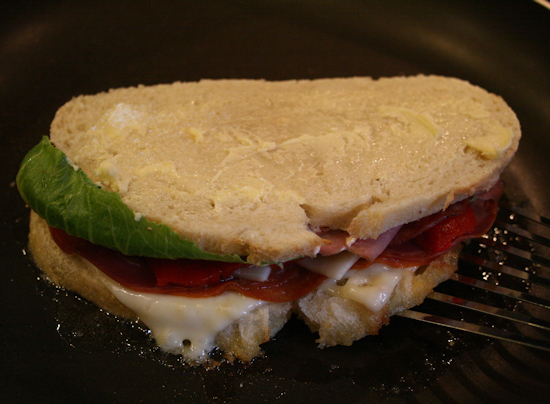 Next, I took that wonderful bread and sliced it into sandwich slices. You can buy bread like this in the bakery section of your super market. After slicing your bread, get out a large skillet and put in one generous pat of butter and melt. 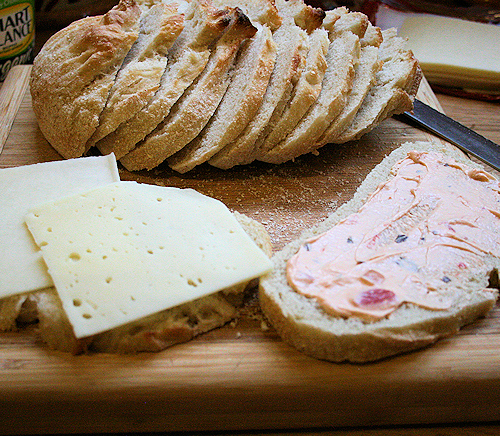 Take two slices and lay them on your working surface. 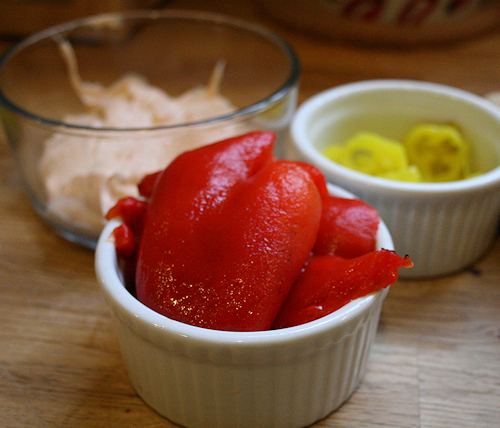 Spread one side with your mayo condiment. Place your chees on the other side. I was living dangerously (because I could not decide) and put one slice of each kind. I had baby swiss and Sargento’s new mixed blend slices Mozzarella and Provolone. Next, layer on the meats. I had peppered salami, turkey pastrami and capicola ham. I love how the stores have those packs of Italian blends. 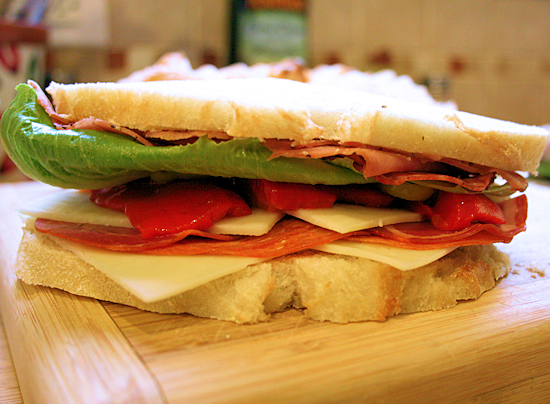 Makes creating an Italian panini so easy! On one side add a few pieces of romaine lettuce and on the other, pile on some roasted red peppers and banana peppers. I love the crunch this gives it with that little kick of spicy and sweet. 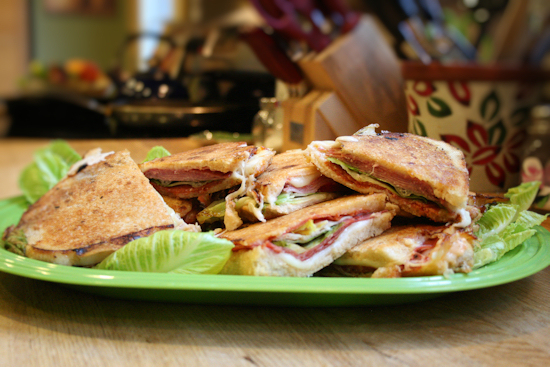 I call this the Italian panini. Smash those halves together and just look at that. 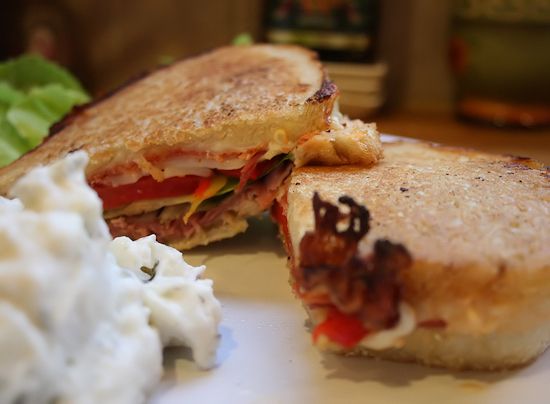 Here is another I made with turkey, provolone, pastrami, baby swiss and the same condiments. I call this the robust turkey. The possibilities are endless. 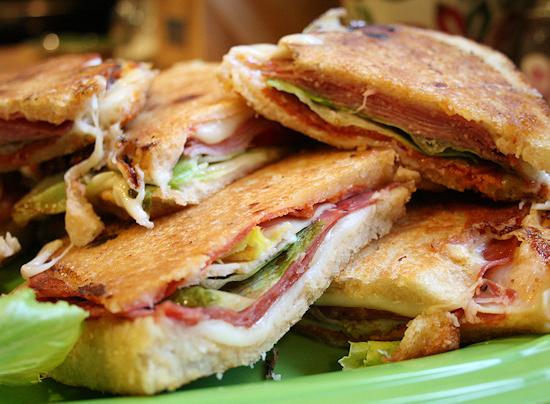 There are no rules to paninis. Almost too pretty to cook. No it’s NOT! 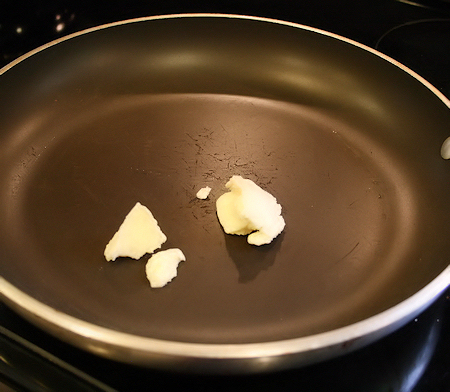 Put that baby in the pan. Lay the sandwich right into the melted butter. Now here comes the ” I don’t have a panani press part”. Get your cast iron skillet or heaviest pot you have or a brick wrapped in tin foil and lay it right on the top of this sandwich. Now notice how we didn’t butter the top of this panini? 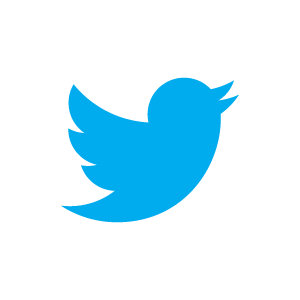 This is why. We don’t want the pan or brick sticking to the bread. 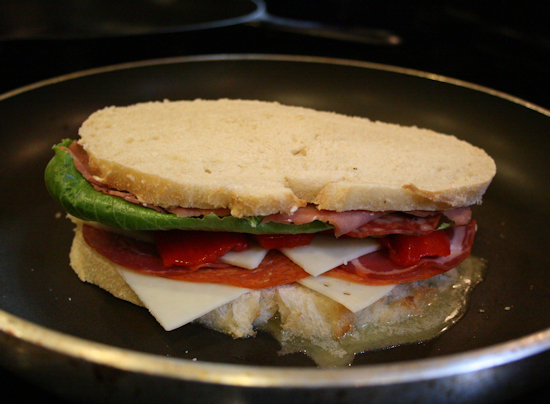 Press down the panini until you can not press anymore and leave the pan there for about 3-4 min. 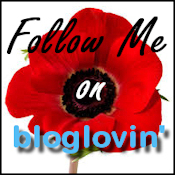 Your heat should be on medium. 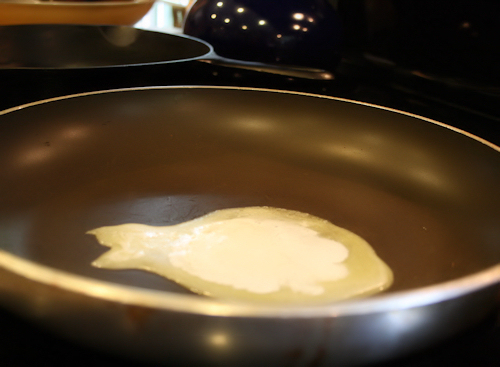 When you are ready to turn over your panini this is when you butter the top very lightly. Take your spatula and carefully turn over. Replace whatever you are using as a weight and press again. 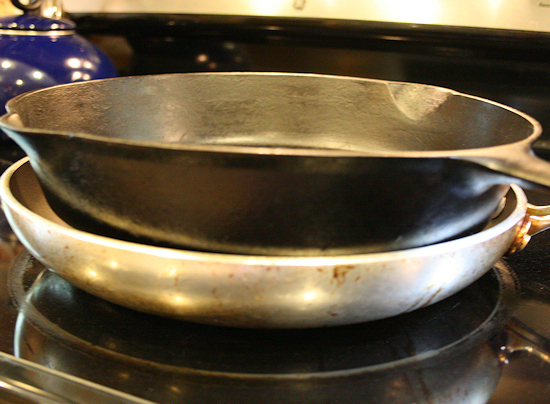 Leave to cook another 3 – 4 minutes weighted. 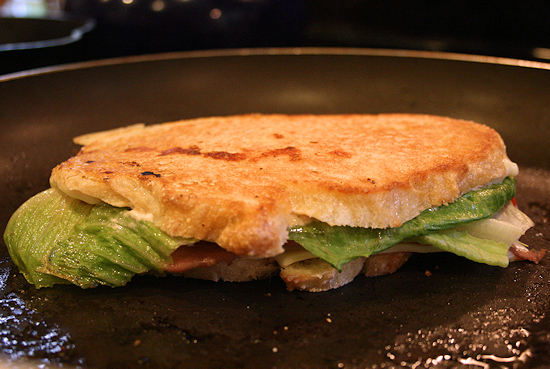 When you are done both sides should look like a perfect grilled cheese. See how melty and yummy it is? I have a dozen of these to make so I better get crackin! After all, I want each one to be a little different. Each bit be a little surprise of meats and cheeses. 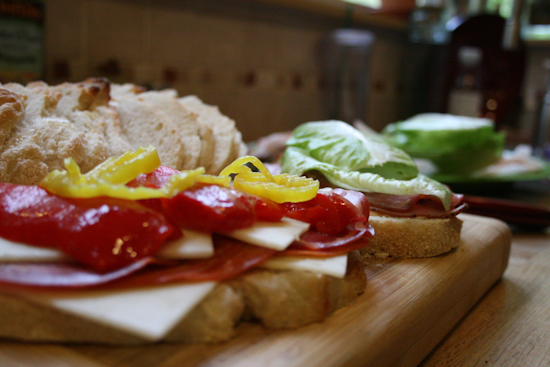 Once you make your first, you will be dying to try different combinations. Someone told me I should try goat cheese and pear(?). And the pile keeps growing. 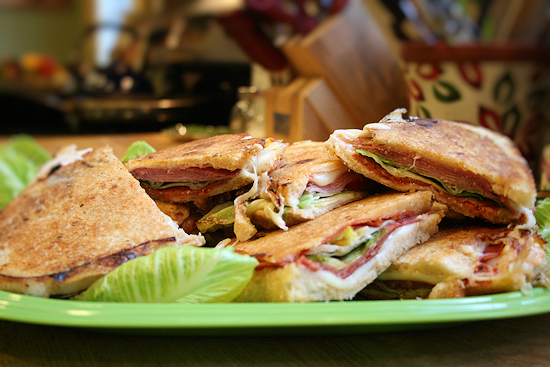 It’s officially a panini party. My family loves panini night. Who needs a panini maker? Not I!